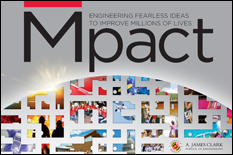 The University of Maryland's A. James Clark School of Engineering will host Mpact Week, a four-day event showcasing the Clark School's research, education, innovation, and entrepreneurial ecosystem, October 23-26, 2013 on its College Park campus. Guests will learn about the Clark School's special emphasis on engineering innovations designed to achieve broad social impact, with the potential to improve millions of lives. Learn how the University of Maryland is transforming technology transfer and venture creation on campus, in the region, and for the nation as a whole. Hear directly from successful start-ups who have benefited from our programs and network with regional investors, advisors, and entrepreneurs. Come see more than 20 startups created at UMD and UMB, including new student ventures and companies launched from university inventions. Learn about the Lean Startup Model, and how the university is employing this methodology to build the next generation of successful startups in Maryland. Hear from Henry "Pete" Linsert, former Chairman of Martek Biosciences, acquired by Royal DSM in 2010 for $1.1 billion, and learn how Martek leveraged the resources of the University of Maryland and the Maryland Technology Enterprise Institute (Mtech) entrepreneurship ecosystem to succeed. Network with regional investors, advisors, and entrepreneurs. Learn how bioengineers are joining forces with colleagues in the medical field to design the next generation of biomedical devices and advanced treatments that will shape the future of human healthcare. Now in its seventh year, the Fischell Festival demonstrates how University of Maryland bioengineering faculty and students are joining forces with colleagues in the medical field to design the next generation of biomedical devices, drugs and vaccines, and advanced treatments of injuries and disease. Learn about the Maryland Robotics Center and its innovative robotics research programs, and see our robots in action. This free event is designed to acquaint you with the University of Maryland's many robotics research projects, faculty, students and facilities. We will introduce you to the Maryland Robotics Center and give you the opportunity to tour our labs, visit with faculty and students, and see our research in action. There is a morning track for student guests and an afternoon track for industry and government professionals. Each track has activities appropriate to its specific audience. Mpact Week will conclude on Saturday, October 26, with a celebration of the Gamera Human-Powered Helicopter Team's world record-breaking accomplishments. Learn more and register for Mpact Week.